Today’s consumer values dexterity and ergonomics when selecting hand protection products.Comfort is great but safety is critical. Safety should not be compromised in favor of comfort.The benefits of a fully coated glove are numerous, especially for the budget-minded buyer. These styles come with a nitrile coating and offers different properties.Palm-covered gloves are suited for handling small parts, the automotive industry, metal stamping,construction and general purpose, by offering better grip, dexterity, increased abrasion resistance, puncture resistance and durability. Nitrile gloves are single-use gloves made from synthetic rubber that mimics latex – despite the fact that nitrile gloves and natural rubber latex gloves share some physical characteristics, the first ones are more resistant to wear and tear and they do not contain any latex protein whatsoever. Moreover, studies have revealed that nitrile gloves are also far more resistant to chemicals and punctures.These gloves are solvent resistant: they can face oils and certain types of acids, this is why they are a great choice for factories and other manufacturing environments. One of the main reasons why physicians opt for nitrile gloves is to prevent allergic reactions in people who are sensitive to rubber.Nitrile gloves are very easy to use and they are available in powdered form (cornstarch powder) or unpowdered form. Also, they are available in all sizes from S to XXL, and they come in a wide range of thicknesses, cuff lengths and textures. They are known for their increased degree of flexibility and for providing the physician with the dexterity it needs. 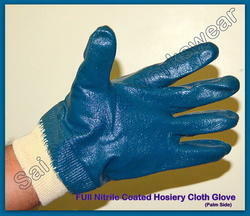 This is a blue Nitrile coated hosiery glove with canvas kuff and is a cut resistant glove. Nitrile coated gloves are a type of disposable glove made from synthetic rubber. The compound Nitrile is a co-polymer and its production process is relatively simple and quite similar to that of rubber production. However unlike rubber, nitrile is a 100% synthetic substance and so, it does not create any sort of allergic reaction on the body and therefore used widely. Although nitrile, the synthetic version of latex lacks the inherent grip and stretch of natural rubber, it is greatly praised for its incomparable strength. 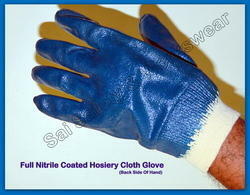 Nitrile Coated Hosiery Glove With Canvas Kuff. White Fine Hosiery Shell With Three Fourth Yellow Nitrile Dipped Gloves Having Jersey Cuff Miadas Make. The high rate of injury in the glass industry is surprisingly—sprains and strains, followed closely by cuts. Grip is therefore of primary importance: losing your grip on glass is when the most extreme injury occurs. Good grip in all conditions is paramount, since often surfaces can be oily or wet. We offer a range of high-tech coatings designed to perform optimally under these conditions. 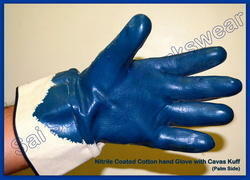 We are dealing in Nitrile cut resistance Hand gloves. Protect your hands from knife cuts, puncturing while working at home, kitchen or in Garden. The product include a pair of hand gloves Size of gloves: 9/L Knitted seamless white nylon liner with grey nitrile coated on the palm and top of finger Provides good grip in dry conditions Back side of gloves are not coated. 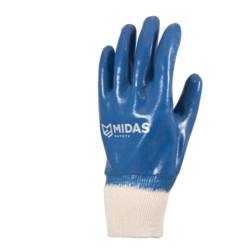 Nitrile Dipped Jersey Cuff hand Glove Midas Make. Size L 330 mm, thickness 0.39 mm. Application Protective against chemicals, and mechanical and food processing Industries. Gray Nitrile Coated Foam Gloves feature gray single flat nitrile-dip on white nylon shells. The nitrile coating provides high abrasion-resistance giving these gloves a grip comparable to foam/air injected nitrile gloves, this construction reduces the risk of dermatitis from liquid exposure that is often associated with wearing foam/air injected nitrile gloves. 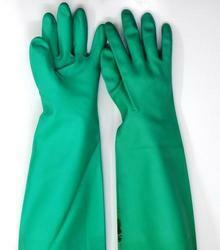 These gloves provide great dexterity and are perfect for oily or wet applications. Available in sizes Small through X-Large. Sold by the dozen. 6 Dozen per case. 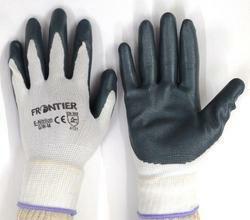 Being one of the quality-oriented firms, we have been occupied in offering an assorted range of Coated Hand Gloves. The offered gloves are stitched with high level of precision by utilizing supreme quality basic materials and modern techniques in line with industry quality standards. These gloves are widely. demanded in hospitals, chemical sector and many other fields. Apart from this, our precious clients can avail these Coated Hand Gloves from us in different sizes and finishes at the most competitive rates. We are offering nitrile coated hand gloves, which are developed using superior quality raw material, at our certified vendor base. 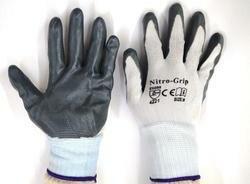 Our gloves are used extensively in automobile, paint, chemical and food industries. Under this range of gloves, we offer nitrile coated gloves, nitrile hand gloves, nitrile flocklined gloves and industrial nitrile gloves. Being one of the quality-oriented firms, we have been occupied in offering an assorted range of Coated Hand Gloves. The offered gloves are stitched with high level of precision by utilizing supreme quality basic materials and modern techniques in line with industry quality standards. These gloves are widely demanded in hospitals, chemical sector and many other fields. Apart from this, our precious clients can avail these Coated Hand Gloves from us in different sizes and finishes at the most competitive rates. The gloves are made of nylon. They are among the most popular types of gloves because of their numerous applications. Nylon gloves are ideal for a variety of applications i.e. in pharmaceutical and electronic industries among many other industries where contamination and inspection are among the major concerns i.e. medical and electronic industries. Nylon gloves come in very many shapes, sizes and design varieties. They are usually classified according to functions. The most common nylon gloves classification according to function are nylon clean room gloves. These are simply nylon gloves offering contamination protection from dangerous and harmful substances. It is important to note that there are many other classifications. Below is a detailed discussion of classifications of nylon gloves according to function.